What a perfect quote to embody New Year. 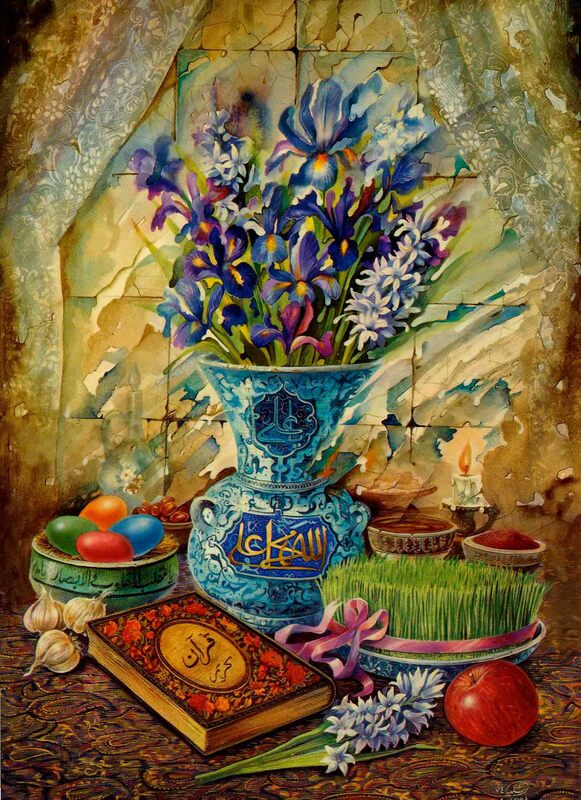 Persian New Year, that is, aka Nowruz! 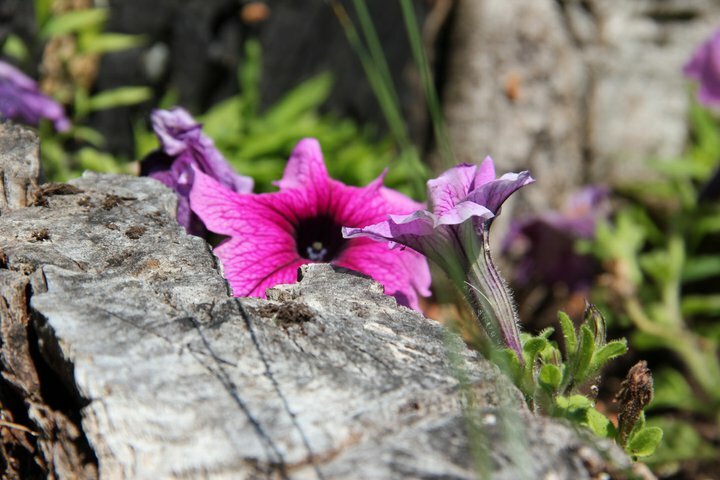 To me, it just feels right and natural to have a new year start with the promise, rebirth, and blossoming of spring. Spring is a reminder of the inner light within each and every one of us. That’s worth celebrating! Scroll down below for a roundup of highly celebratory (and symbolic) recipes from fellow Persian food bloggers. Thanks to the fabulous Sanam, of My Persian Kitchen, for putting this together! Oh, technically the big day of the Persian New Year is always the spring equinox, which falls on Thursday, March 20, this year. Now’s as good a time as any to spread the happiness and to prepare for a fresh new season. At the moment, I’m in a bit of Spring Cleaning Mode. (Oooof, those closets needed every ounce of attention I gave them last weekend. Ha!) I’m also prepping to host another yoga retreat, in upstate New York/in the Hudson Valley area. March 14-16—perfect timing to get us ready for spring. Looks like 2014 is a year of new beginnings for me in many ways. I’m headed to India at the end of the month. This trip has been a dream of mine for many years. At just the right time, the stars aligned, the Universe and those I love are shining their support and approval on me, and I’m flying off on the night of the new moon. It’s happening! Fae’s Twist & Tango: Naw-Rúz, A New Year Recipe Round-up! Happy Summer, everyone. Having at least a little fun? Eaten anything amazing lately? Hope so. Honestly, my eating habits have been a real snoozefest these days, and all of these heat waves have done a number on my appetite and motivation to create new recipes. Do we really need another quinoa salad blueprint? It’s just a hunch, but I’m pretty sure you can rig up your own romaine salad with sliced strawberries and toasted pine nuts. Right? Right. 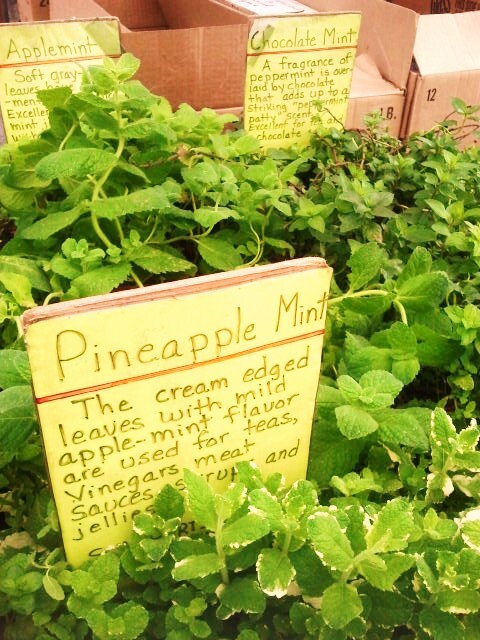 Spotted so many varieties of mint at the NYC Union Square Greenmarket the other day. 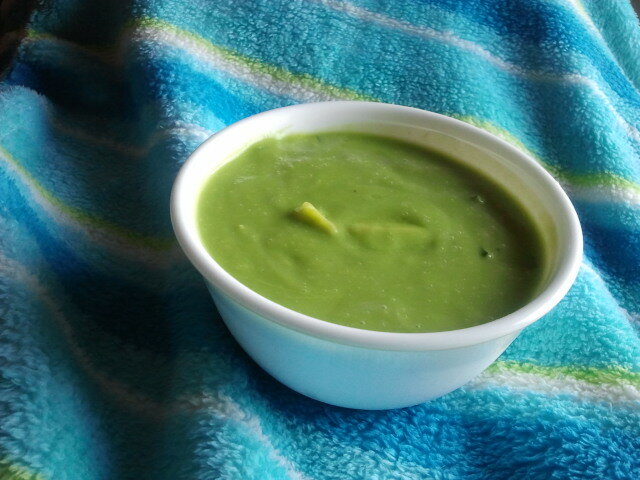 However, a flash of inspiration and a tad of laziness actually inspired a recipe worth sharing: Minty Green Gazpacho. This all happened because my Ayurvedic doc, Pratima, recommended that I limit my consumption of tomatoes. This is the amazing woman whose regimen and advice got my skin from painfully and constantly breaking out to totally clear, calm, and makeup-free. So when she gives me dietary advice, I tend to follow it (for the most part; I’m not perfect). I do LOVE a good gazpacho, but she’s right…it’s a bit heating for me, especially in the summer. Plus, I was looking for something soupy, cooling and velvety to enjoy for lunch one day. Something green that would nourish but not weigh me down or sap my energy. 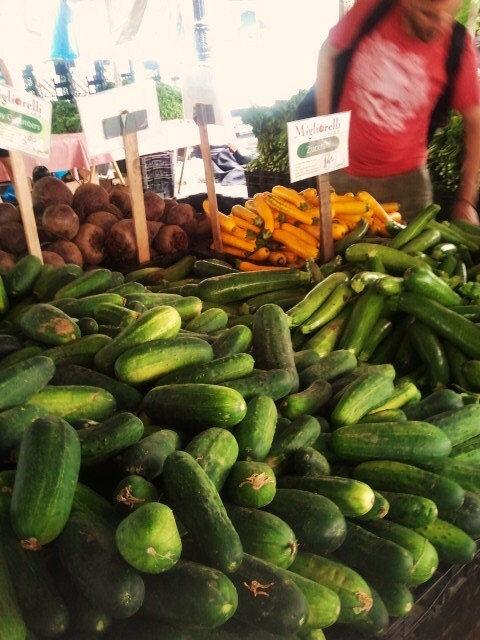 Fresh mint, zucchini, and cucumbers at the farmers inspired me. This soup comes together quickly in a blender or food processor, and can be served hot, cold, or at room temp. Yield: 8 cups (64 ounces). Recipe can easily be halved. Seasoning packet or bouillon cube of choice (I used this stuff by Goya. So sue me). 1. Chop half of the zucchini and half of the cucumbers into chunks your blender can handle. Add chunks to your blender, along with liquid, seasoning packet, and garlic. Add more liquid as needed. Blend until smooth. I used my Vitamix, and with the lid securely attached, was able to let the soup lightly cook/blend as I worked on step 2. . . .
2. As the soup blends, dice your remaining zucchini and cucumbers. Dice the onion as well. Prepare the avocado (removing pit and scooping out flesh). 3. Now blend in the mint (or extract) and avocado. In the Vita-mix, I added these final 2 ingredients in after blending for 5-6 minutes. I blended for one more minute. 4. Test for seasoning and adjust and re-blend as needed. Pour soup into a serving bowl, and gently mix in diced zucchini, onions, and cucumbers. Garnish with fresh mint and serve, or allow to cool in fridge and serve cold. It’s been a minute since I’ve posted a Persianized recipe on here. Sorry about that! 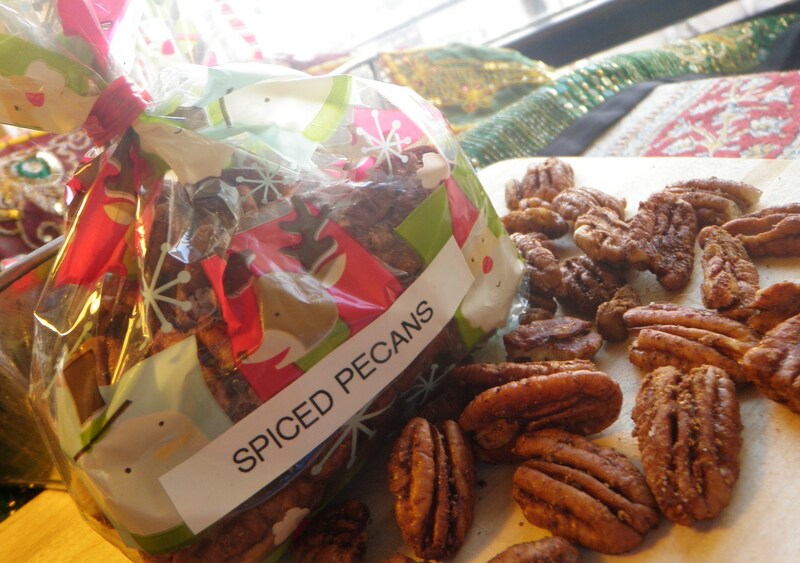 These saffron spiced pecans are the perfect remedy to my laziness, and they make a fabulous holiday gift. 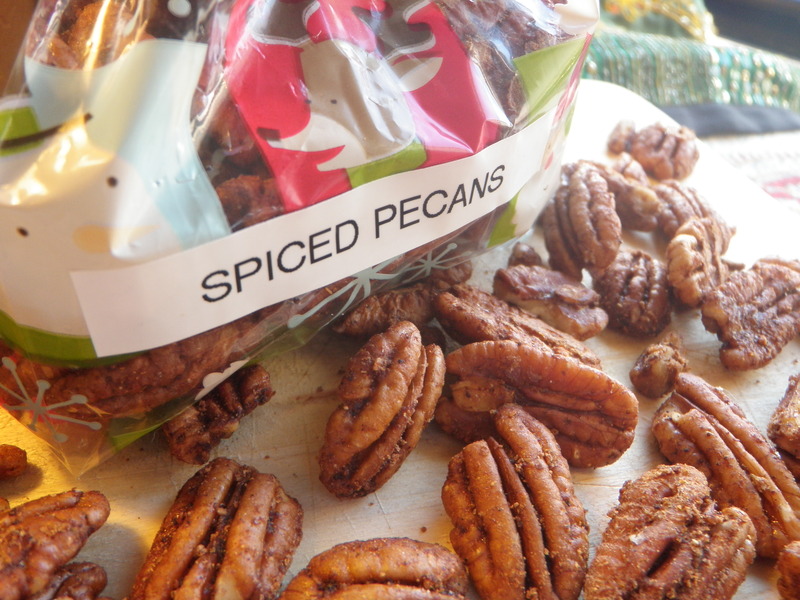 Persian spiced saffron pecans are easy to make and make delicious holiday gifts. I apologize right now for the “spoiler,” because some of ya’ll who read this are getting these as part of your Christmas package. (Sorry, Dad, but you’re just so challenging to buy for!) If anything, after seeing this post, maybe they’ll be looking forward to their nuts. A nice change of pace from the Yoga pants and ponytail. 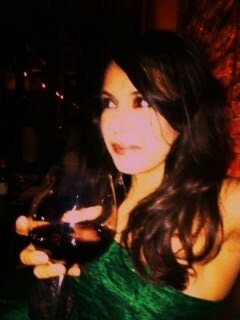 Tribeca, NYC, December 2011. Anyways, I’m about done with holiday gifting. I deliberately keep my gifting list short, and am a big believer in showing appreciation and affection to friends and fam throughout the year. I do have a couple of post office runs to make to mail off gifts, and some of you know how I feel about those. Yeesh! Recipe an adaptation of one by Dorie Greenspan, from Around My French Table. Easily doubles, triples, and so on. . . .
2 Tablespoons advieh (Persian spice mix) OR pumpkin pie spice (they have similar ingredients). 1. Preheat oven to 300 F. As oven heats, in a mixing bowl, run a whisk through the egg white a few times. 2. Add in honey (or sub), salt, and spices. Whisk some more until well blended. 3. Fold in the nuts and mix to coat well with spice mixture. 4. Line your baking sheets (I used 2) with foil, and then pour nuts and any liquid into a single layer on each sheet. Bake for 20 minutes, checking for crispness at 20 minutes. If you need to bake more, do another 5 minutes. I’ve never had to bake these for more than 25 minutes. 5. Remove from oven. Let cool slightly, then carefully remove from foil. Let cool more, then bag them up in cute gift baggies. At my recent Yoga retreat, quinoa was on the menu, but we ended up not making it. We had so many other delicious things, so it fell out of the rotation. I didn’t miss it, because I thought I didn’t really like it. Until now. You will, too, I bet. You could even take this to any Fourth of July festivities you might be celebrating this weekend. It’s easy to make and travels well. I used white, also known as yellow, quinoa in my recipe. Look for it in the rice/grain section part of your store. Technically, it's not a grain. It's a seed. And it's gluten-free and very high in protein as well. Photo via wikipedia. Back to my quinoa breakthrough. Imagine, cooking quinoa according the package directions, and it turning out awesome? Who’d have known? Certainly not me, as I’m not always one for following directions. I can barely make my own recipe the same way twice, much less another person’s. Ha! 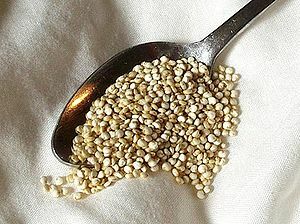 I stumbled upon this recipe the other night when “shopping in my cabinets.” I decided to do something novel for me and made the quinoa according to the package directions (fry a cup of quinoa for 20 seconds in butter or oil, add two cups of boiling water, cover, simmer for 20 minutes, covered, over a low heat). 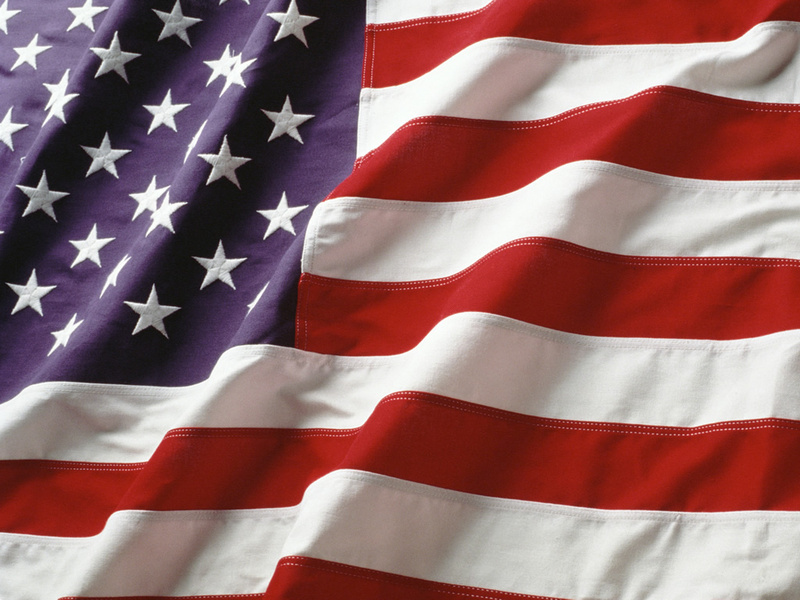 Happy Birthday, America. You're 235, you say? Well, you're forever 21 to me. As it cooked, I chopped up a bunch of veggies that were hanging around unused: some roasted red peppers, celery, a couple of artichoke hearts. I added a can of (drained) white beans. Then I mixed this all into the fluffy quinoa, along with a couple of drizzles of olive oil, some ground cumin, and some Trader Joe’s 21 Salute seasoning (salt-free and very versatile!) I threw in some nutritional yeast, too. It was a hit, and a new summer staple was born. It tastes lovely hot, cold, or at room temp. It travels well, and it’s light yet filling. It’s a flexible recipe: vary the veggies and spices and come up with your own combos. Plus, quinoa is high in protein; along with the beans and veggies, you have a balanced one-dish meal or side. Quinoa, I’m sorry for my past indifference and for leaving you out of the retreat festivities. I promise I’ll make it up to you somehow, someday! 1. Cook quinoa according to package directions. 2. As quinoa cooks, chops up veggies, drain beans, and gather spices. 3. Once quinoa is done (takes about 20 minutes), remove from heat. Fluff with a fork, add spices. Lightly stir. Add oil. Fluff a bit again. Add veggies and beans and stir again. Taste and adjust seasoning, oil, and veggies amounts if needed. That’s IT! Pistachio Nut Butter with a touch of honey. 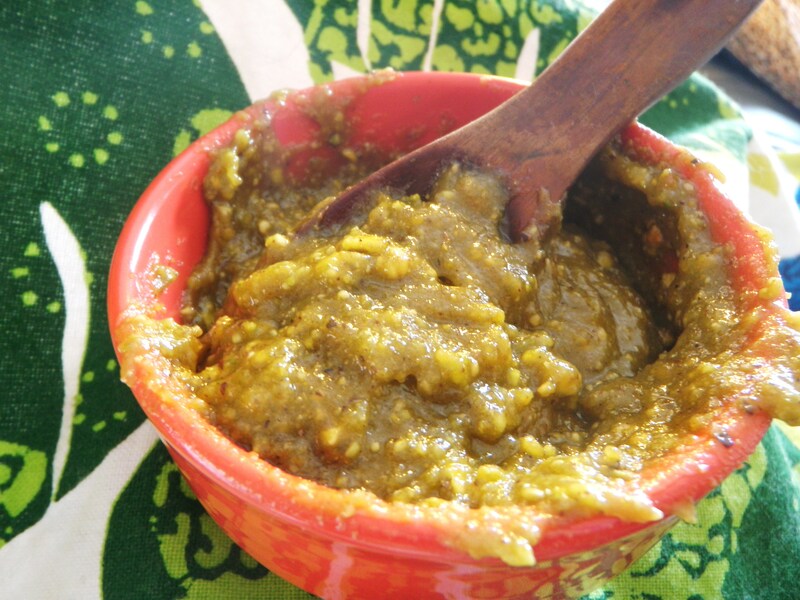 It's actually very easy to make your own pistachio butter. Lately I’ve been “shopping” in my own pantry and fridge to use up goodies already on hand and keep some money in my pocket. There is so much upheaval and need in the world on any given day, but lately it seems like so much is going on. It gets a bit overwhelming sometimes. So I’m focusing on having an attitude of gratitude and creating more with less. It just so happens that I am lucky enough to have a surplus of pistachios at the moment, so I decided to make a nut butter with them. It took all of five minutes, turned out great, and I already have some easy recipes ideas in mind to use it in. Anything that’s good, I’ll share with you. Of course, it’s quite delicious on its own. Or melted a bit on top of ice cream, in a sandwich, or mixed into oatmeal. Those are just a few ideas; as you can see, there are tons of uses for this stuff, as with any nut butter. Leave your ideas in the comments. Stay tuned for some upgrades to West of Persia. I’m working on an Amazon store for the site, and also have a cool giveaway coming up. Have a great day! NOTE: Take a look at your blender or food processor’s instructions for making nut butters, and adjust your use of your machine as needed when making this, or any, nut butter. I made mine with my Vita-Mix, and just used the wet blade (I don’t own the dry blade). 1. Grind the nuts in your machine until they’re broken down into chunks, but NOT pulverized. 2. Now add in oil, a Tablespoon at a time. Also add in honey and about half a tablespoon of water. Grind on low as a paste begins to form. 3. Stop blender, scrape down sides, and re-blend, adding water IF NEEDED little by little to get (or keep) things moving. Repeat this step as needed. Stop blending when the desired consistency is reached. I like my nut butters chunky sometimes, so I left this pistachio butter on the chunky side this time. Avocados star in this creamy, vegan milkshake, along with pistachios and coconut milk. You won’t believe for one second that my Creamy Pistachio Almond Milkshake is healthy. No way. In fact, anyone who drinks it will swear it’s decadence in a glass. It’s a great way to get the good fats and other awesome nutrients from avocados, coconut milk, and pistachios into your body. Remember, don’t fear the good fats! This is one of those recipes that came together in no time, with ingredients I had on hand, including an avocado that needed to be used up pronto. 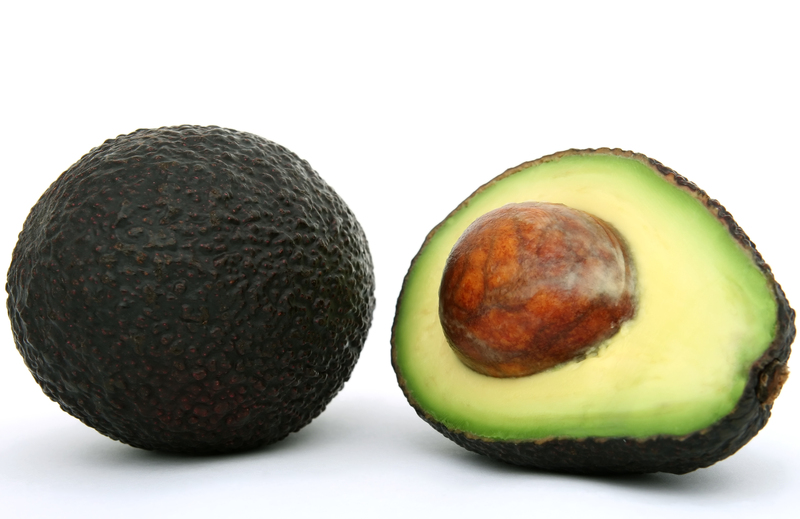 The avo gave it a beautiful pale green color, almost minty. 1. Place all ingredients in a blender. Blend all ingredients together until well incorporated, smooth, creamy, and thick. Use additional milk if you desire to thin the milkshake. Pour, serve, and enjoy. Ginger, garlic, and chile are the foundations of this simple soup. I used chipotles that were pre-cooked in adobo sauce, but you could use other peppers if that's easier for your. Photo courtesy of stock.xchng. A thorough, if late, deep housecleaning to prep for Persian New Year (Nowruz). To send out some of said treats as gifts. A delicious Persian New Year feast over the weekend. Oh, and to teach just shy of 20 classes. . .
. . . AND to serve as a bridesmaid in my friend’s wedding this weekend. Yeah, right. That sound you hear? That’s the Universe laughing at my plans. Loudly. I’m laughing now, too, at myself for thinking I could get all of that stuff done, even under the best of circumstances. You see, I started feeling not so great late last week, and haven’t been quite able to shake the feeling since. So I scaled back on my ambitions, focusing on resting and working and, quite frankly, just getting through the week. (Don’t worry, I don’t teach with a fever and I’m not doing adjustments this week just to be on the ultra-safe side). 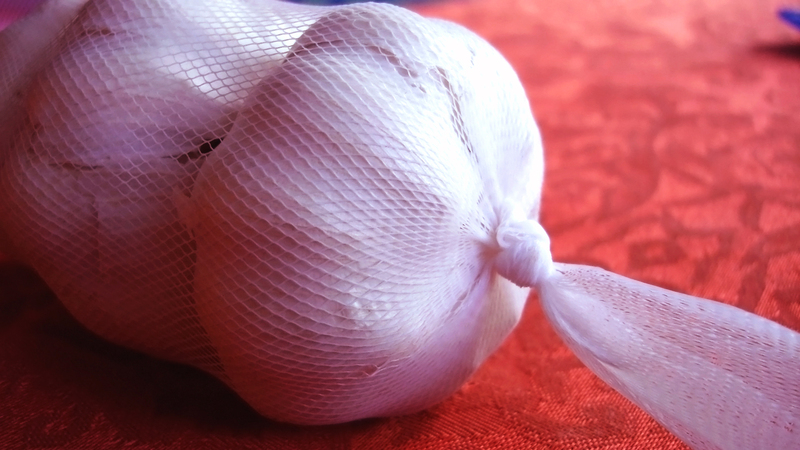 I have so much garlic around my place. It's slightly ridiculous, and no, I don't fear vampires 😉 Photo courtesy of stock.xchng. I also threw everything but the kitchen sink (and the doctor) at this annoying bug. You name it: Vitamin C, immune supplements, kombucha, juices, garlic, ginger, spices, cake, sleep, TV, movies, tea, menthol, baths, books, carbs, probiotics, Swedish bitters, and probably at least a half-dozen more things. It’s been quite stubborn. Very strange, considering I’m rarely sick. 1. 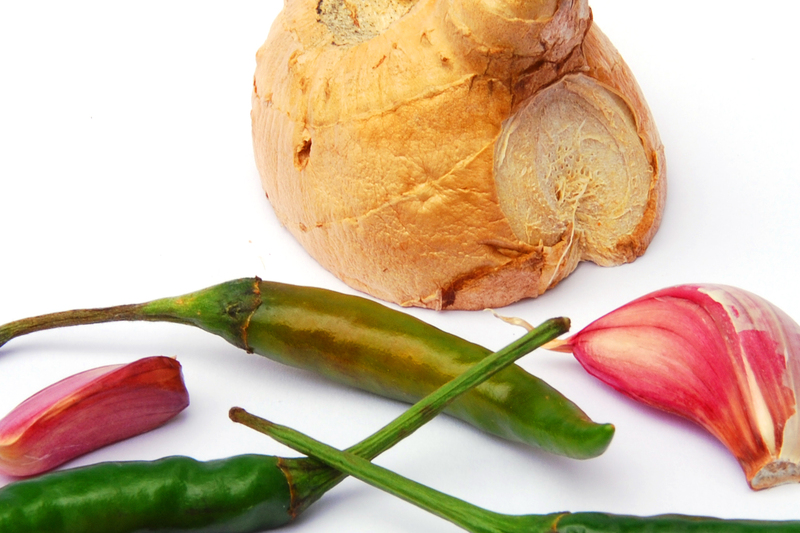 In a blender, combine ginger, garlic, chili, onion, and broth. Blend until smooth. 2. Pour mixture in a slow cooker. Add potatoes and carrots, and cumin, if using. Stir. Cook for 4 hours. 4. Ladle into bowls and serve topped with scallions and/or avocado chunks.